The Liberty Flames scored on a passed ball in the top of the 10th inning to defeat the Elon Phoenix, 1-0, Tuesday at Latham Park. In the top of the 10th inning and no score, Liberty put runners on the corners with one out and went on to score the game’s only run. Shortstop Cam Locklear led off the inning with a single, which dropped between the second baseman and right fielder, and moved to second on a sacrifice bunt by third baseman Andrew Kowalo. Pinch hitter Payton Scarbrough then reached on a fielding error by Elon third baseman Cam Devanney, to put Flames at first and third. It was the first time that a Liberty runner had reached third in the contest. After Phoenix reliever Nick Bealuc retired the next Liberty batter and with left fielder Jake Barbee at the plate, a pitch got away from Elon catcher James Venuto for a passed ball, allowing Locklear to score the game’s only run and give Liberty a 1-0 lead. In the bottom of the inning, the host Phoenix moved runners to second and third with two outs. Liberty reliever Shane Quarterley, who entered the game in the seventh inning, walked and hit a batter with two outs. After a wild pitch allowed both runners to move into scoring position, Quarterley struck out Venuto to close out the victory. Liberty moves to 5-3 on the season. The Flames have won both of their road contests of 2017. Elon drops to 3-5. 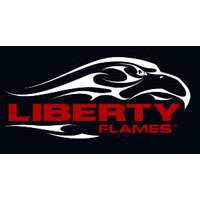 Liberty received a strong outing from left-hander Vinnie Tarantola in his first start in a Flames’ uniform. The junior college transfer held Elon to three hits over 6 1/3 shutout innings. He struck out three and walked three, one intentionally. Meanwhile, Quarterley moves to 2-0 on the year. He pitched 3 2/3 innings of scoreless relief. The right-hander did not give up a hit, while striking out five and walking one. He struck out the side in the eighth. Tarantola and Elon right-hander Sean Byrnes did not allow either team a run through the first five innings. The Liberty left-hander faced only one batter over the minimum 15, yielding a bloop single to left field by Phoenix shortstop Ryne Ogren with two outs in the fourth. Meanwhile, Byrnes held the Flames to two hits over the same span. In the bottom of the sixth, Elon mounted a scoring threat, but came away empty. Catcher Hayden Platt walked, and right fielder Liam O’Regan moved pinch runner Tyler Stanley to second with a sacrifice bunt. Center fielder Zach Evers followed with a sharply hit single to left field. Stanley tried to score on the hit, but Flames left fielder Jake Barbee threw him out at home to keep the game scoreless. The Phoenix loaded the bases in the seventh with one out. Designated hitter C.J. Young led off the inning and moved to second on a sacrifice bunt by Ogren. After left fielder Kyle Jackson received an intentional walk, first baseman Will Nance drew a walk to load the bases and end the afternoon for Tarantola. Quarterley entered and promptly induced third baseman Cam Devanney to ground into a double play and end the inning. Elon’s Byrnes did not figure in the decision. He gave up two hits, before giving way to reliever Kellan Elsbury with one out in the fifth inning. Byrnes struck out three and did not walk a batter. Phoenix reliever Derek Pike falls to 0-1. The fourth of five pitchers for the host team, he allowed the game’s only run over 1 1/3 innings of relief. He struck out one Flame. Both teams each had three hits apiece. Elon committed two errors. Up Next: Liberty begins a 12-game homestand on Friday. The Flames will host the Bryant Bulldogs for a three-game series. Friday’s series opener at Liberty Baseball Stadium is scheduled for 3 p.m.